After calculating another $120 of pipe and fittings to run a parallel armature six inches along side of the original armature, I cannibalized most of the materials from other uncompleted projects. I am using ½ inch galvanized pipe and fittings. The purpose of this addition to the armature is to remove the slight motion I am getting from right to left with the original single pipe structure. The first step was to remove the cross-section or top of the arch. Left and right upright sections of the arch without the cross-section. I had to cut away most of the foam and attach the parallel pipe and fittings to the cross-section of the armature. This cross-section of the arch is the portion of the sculpture I am going to work on the ground and then attach it to the uprights when it is completed. 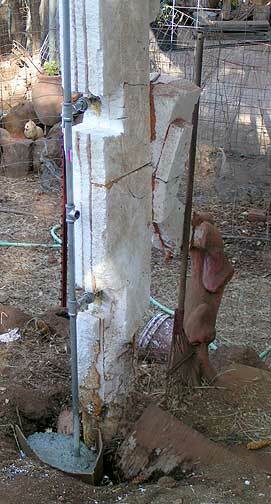 Armature for the cross-section of the arch and portion covered with Styrofoam. 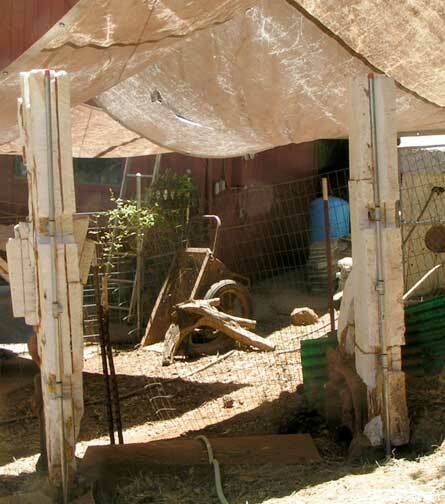 The 1/2 inch pipes will serve in lieu of a capstone but the decorative capstone at the top of the arch will be a male San Clemente goat’s head with a solar disk between his horns. 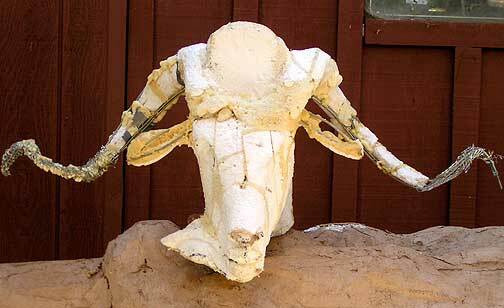 Goat head, carved in the rough, will sit at the top of the arch when completed. The parallel pipe and fittings are connected to the two upright sections and cemented in place below the ground. The two parallel armatures are connected with “union” fittings as shown in Part 1. The back side of the right upright portion of the sculpture. The parallel pipe is attach with union connectors and cemented in the ground. This whole thing looks pretty messy and not very beautiful. But this is the guts of the sculpture. There is one rule to sculpting in cement. There must be no movement in the armature. Cement has many properties, weather resistance, hardness, durability. But cement has no give or tensile strength. and any movement in the armature will cause the cement to crack in ways that cannot be easily repaired. So get it right the first time no matter what it takes or suffer the losses. By the way comments and questions are welcome on this blog, especially from my students and former students. Posted on June 21, 2013, in Psi Keep Center for the Arts, Sculptures, Uncategorized, Unforeseen Events and tagged art center,, art classes in cement, cement sculpture, cement workshops, psiKeep center for the arts, sculpture, sculpture construction. Bookmark the permalink. 1 Comment.